I find lunch is the hardest meal to make healthy choices. We frequently eat out for lunch, which can limit healthy choices. 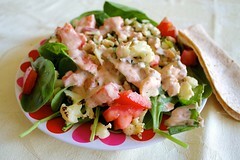 Or if you are at home or packing a lunch, you want something that is quick and easy. I know many people have a “no cook” lunch rule, which I admire and find too limiting at the same time. When I worked full time, many of my coworkers relied on frozen meals for their lunches. It’s the time of day when we are hungry, but not in the mood or mode to spend a lot of time or energy. One of my goals for the past several years has been to get at least two servings of vegetables in at lunch most days of the week. That way I know I have gotten something good in me, even if dinner ends up being an “I only have energy for pancakes” affair. But that goal hasn’t been as easy as it would sound. I’ve documented here several of my lunches and some of my tips for getting more veggies in at lunch. All of these take 5 minutes or less and can be done very affordably. -Have cut up veggies ready to go. I cut up a big bunch of carrots and celery every week. Then, if all else fails, I can grab a handful of each and go. -Along with those veggies, have some dips for yourself: hummus, baba ganoush, ranch dressing, peanut butter, or whatever your poison is. 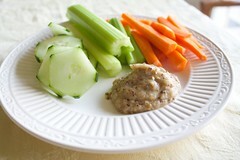 Make sure to keep the dip portion in control, as you don’t want to eat a ton of fat. But do what it takes to get those veggies down! -Be creative. You don’t have to eat something the way it was “intended”. I had some leftover marinara sauce, which I had packed full of extra carrots and chunky tomatoes, but nothing to eat it with. Ramen noodles minus the seasoning packet to the rescue. 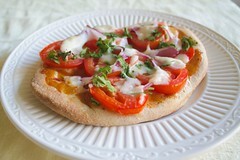 Or a leftover naan bread with a little barbecue sauce, tomatoes, and some cheese becomes a pizza. -Stock your kitchen with easy “add-ins”. Here, I added frozen broccoli, a few spears of broken up asparagus, and chopped tomato to some leftover pasta. 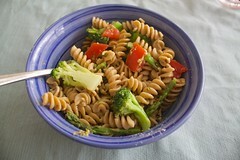 A little jarred pesto stirred in made it a yummy lunch. 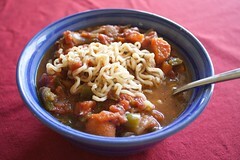 -Mix veggies into other things. I love having frozen broccoli or fresh spinach on hand. A quick microwave and they mix in to whatever else I’m making, be it soup or macaroni or whatever. -Embrace salads. I’m sorry if you don’t like salad. I like salad, but can easily get sick of it. Here are a few tips I’ve found for making salads more palatable and still a quick option. -Pick your green and your dressing. 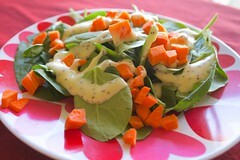 For me, I can eat a pretty simple salad of just spinach and poppyseed dressing. Give me lettuce or any other dressing, I need a lot more toppings to enjoy it. Find what works for you and stick with it. -Add fruit. 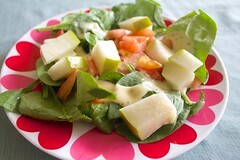 Grapes, apples, pears, strawberries, and many other fruits lend themselves very well to being a salad mix-in. The sweetness and the juiciness can help tone down the bitter, crunchy veggies. 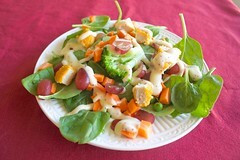 -Use your salad as a base for something else. This salad was one of my favorites. I had some leftover filling from quesadillas the night before. I just put that on top of a small bed of spinach. It was so yummy, and I almost forgot I was eating salad. -Don’t eat only salad. As you can see in the picture above, I had a quesadilla with that salad. I often have a sandwich or something else with the salad. But I always eat my salad first. Then I can savor and enjoy my other items, knowing I got the healthy things in first. I hope some of these ideas help you. Lunch is a tough meal to conquer. I’d love to hear your lunch go-to ideas in the comments.